This method is OLD. We have created smart phone application GISAR. Please use GISAR in following page. Markers in your "Google My Maps" will appear in smart phone AR. iPhone and iPad are not supported. It works Android Smart Phone only. Your suggestions to create IOS version are welcome. We are using Android Firefox for development. If you do not have the Firefox, download. Prepare Google Map and publish it. Please be sure to Share your map to PUBLIC, otherwise we cannot read it for conversion. then, the underscored part 1zFLzG4BxY2d7uWH43wJStiOP7b0 is the Map ID. 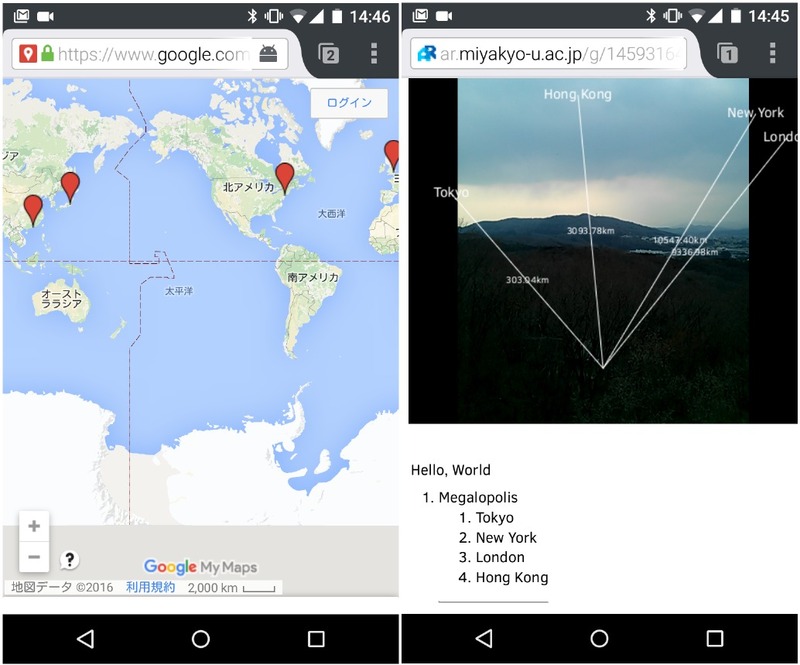 Convert Google Map to AR by using Map ID. Connect and enter Map ID. Enter Map ID in next CGI window. Converted Data Download Link, Preview URL, QR code will appear. Type the URL to Android Firefox or Read QR Code with Reader Apps, then the markers in your "Google My Maps" will appear in your browser. By scrolling down, you will find the marker title and the description. When you move to another place, you must reload the page for read the current position. Copyright of the data and the cache period. This conversion service is made by caching shared Google Maps data in our server. Although conversion is conducted by your clicking, the Copyright is remaining in Google and the Map creator. The data will be cached at least one month. If deleted, convert again.